Peter Honey and Alan Mumford recommend that to maximise personal learning, each learner ought to understand their own learning style and seek out opportunities to learn in their learning style. But they should also develop their learning capacity in other styles to become a more well-rounded learner. This increases versatility in learning situations. 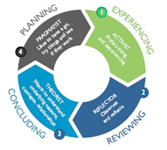 The Learning Style Questionnaire is under copyright and can be accessed here https://www.talentlens.co.uk/develop/peter-honey-learning-style-series which provides an online demonstration link to the Learning Styles Questionnaire (LSQ). Activist – hands-on; respond to learning through trial and error. Activists involve themselves fully and without bias in new experiences. Activists enjoy the here and now, and are happy to be dominated by immediate experiences. They are open-minded, not sceptical, and this tends to make them enthusiastic about anything new. Their philosophy is: “I’ll try anything once”. Activists also tend to act first and consider the consequences afterwards. Their days are filled with activity. They tackle problems by brainstorming. As soon as the excitement from one activity has died down they are busy looking for the next. They tend to thrive on the challenge of new experiences but are bored with implementation and longer term consolidation. They are gregarious people constantly involving themselves with others but, in doing so; they seek to centre all activities around themselves. Theorist – convince me; respond to learning through clarity of argument. 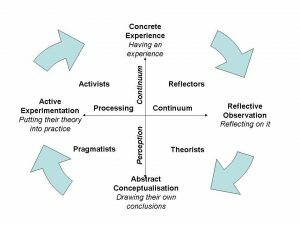 Theorists adapt and integrate observations into complex but logically sound theories. Theorists think problems through in a vertical, step-by-step logical way. They assimilate disparate facts into coherent theories. They tend to be perfectionists who won’t rest easy until things are tidy and fit into a rational scheme. They like to analyse and synthesize. Theorists are keen on basic assumptions, principles, theories models and systems thinking. Their philosophy prizes rationality and logic. “If it’s logical its good.” Questions they frequently ask are: “Does it make sense?” “How does this fit with that?” “What are the basic assumptions?” They tend to be detached, analytical and dedicated to rational objectivity rather than anything subjective or ambiguous. Their approach to problems is consistently logical. This is their ‘mental set’ and they rigidly reject anything that doesn’t fit with it. Theorists prefer to maximise certainty and feel uncomfortable with subjective judgements, lateral thinking and anything flippant. Honey, P. and Mumford, A. (2000). The learning styles helper’s guide. Maidenhead: Peter Honey Publications Ltd.
Honey, P. and Mumford, A. (1995). Using your learning styles. Maidenhead: Peter Honey Publications Ltd.